Not to be confused with Nagorno-Karabakh War. The Armenian–Azerbaijani War, which started after the Russian Revolution, was a series of conflicts in 1918, then from 1920–22 that occurred during the brief independence of Armenia and Azerbaijan and afterwards. Most of the conflicts did not have a principal pattern with a standard armed structure. The Ottoman Empire and British Empire were involved in different capacities: the Ottoman Empire left the region after the Armistice of Mudros but British influence continued until Dunsterforce was pulled back in the 1920s. The conflicts involved civilians in the disputed districts of Kazakh-Shamshadin, Zanghezur, Nakhchivan and Karabakh. The use of guerrilla and semi-guerrilla operations was the main reason for the high civilian casualties, which occurred during the nation-building activities of the newly established states. The reasons behind the conflict are still far from being resolved after nearly a century. The story of this campaign has very different perceptions from Armenian and Azerbaijani viewpoints. According to Armenian historians, the First Republic of Armenia aimed to include Nakhchivan among the basic (Eastern Armenian) territories of the Erivan Governorate, as well as the eastern and southern parts of the Elisabethpol Governorate. The first clashes between the Armenians and Azerbaijanis took place in Baku in February 1905. Soon the conflict spilled over to other parts of the Caucasus, and on August 5, 1905, the first conflict between the Armenian and Azerbaijani population of Shusha took place. In March 1918 ethnic and religious tensions grew and the Armenian-Azerbaijani conflict in Baku began. The Müsavat Party and the Committee of Union and Progress parties were accused of Pan-Turkism by Bolsheviks and their allies. Armenian and Muslim militias engaged in armed confrontations, which resulted in heavy casualties. Many Muslims were expelled from Baku or went underground. Meanwhile, the arrest of Gen. Talyshinski, the commander of the Azerbaijani division, and some of its officers—all of whom arrived in Baku on March 9—increased anti-Soviet feelings among the city's Azerbaijani population. On 30 March the Soviets, based on the unfounded report that the Muslim crew of the ship Evelina was armed and ready to revolt against the Soviets, disarmed the crew which tried to resist. This led to three days fighting,resulting in the death of up to 12,000 Azerbaijanis. At the same time the Baku Commune was involved in heavy fighting with the advancing Caucasian Ottoman Army in and around Ganja. The Ottoman Empire's Enver Pasha began to move forward with the newly established Army of Islam. Major battles occurred in Yevlakh and Agdash. Dunsterville ordered the evacuation of the city on September 14, after six weeks of occupation, and withdrew to Iran; most of the Armenian population escaped with British forces. The Ottoman Army of Islam and its Azerbaijani allies, led by Nuri Pasha, entered Baku on September 15 and slaughtered between 10,000–20,000 Armenians in retaliation for the March massacre of Muslims. The capital of the Azerbaijan was finally moved from Ganja to Baku. However, after the Armistice of Mudros between the United Kingdom and the Ottoman Empire on October 30, Turkish troops were substituted by the Triple Entente. Headed by British Gen. W. Thomson, who had declared himself the military governor of Baku, 1,000 Commonwealth soldiers arrived in Baku on November 17, 1918. By Gen. Thomson's order, martial law was implemented in Baku. The Armenian government tried several times to seize Shusha militarily. In 1918 a Republic of Mountainous Armenia was declared in the region. However, throughout the summer of 1918 Armenians in the mountainous Karabag region, under the leadership of Andranik Ozanian, resisted the Ottoman 3rd Army. After the Armistice the Ottoman Empire began to withdraw its forces and Armenian forces under Andranik seized Nagorno-Karabakh. Armistice of Mudros brought Gen. Adriank the chance to create a base for further expansion eastward and form a strategic corridor extending into Nakhchivan. In January 1919 Armenian troops advanced towards Shusha. They captured nine Azerbaijani villages on their way. Just before the Armistice of Mudros was signed, Andranik Ozanian was on the way from Zangezur to Shusha to take control of the main city of Karabakh. In January 1919, with Armenian troops advancing, the British military command asked Andranik back to Zangezur with the assurances that this conflict could be solved with the Paris Peace Conference. Andranik pulled back his units and the British command at Baku gave control to Khosrov bey Sultanov, a native of Karabakh and "ardent pan-Turkist", who was appointed the general-governor of Karabakh and ordered by the British to "squash any unrest in the region". Sultanov ordered attacks on Armenian villages the next day, increased the sizes of Azerbaijani garrisons in Shusha and Khankendi and drew up plans to destroy several Armenian villages to sever the link between Armenians in Karabakh and the region of Zangezur. In response to a border proposal by Sir John Oliver Wardrop—British Chief Commissioner in the South Caucasus—that would have assigned Nakhchivan to Armenia, Azerbaijanis of Nakhchivan revolted under the leadership of local landowner Jafargulu Khan Nakhchivanski in December 1918 and declared the independent Republic of Aras, with its capital in Nakhchivan. The republic, which was essentially subordinate to Azerbaijan, continued to exist until May 1919, when Armenian troops led by Drastamat Kanayan advanced into it to gain control over the region. They managed to capture the city of Nakhchivan in June 1919 and destroy the Republic of Aras, but afterwards fought combined regular Azerbaijani and Ottoman troops, which reinstated Azerbaijani control over the city in July. On 10 August 1919 a cease-fire was signed. Fighting resumed in March 1920 and continued until the Sovietization of Nakhchivan in 1920 by the 11th Red Army, now including former Azerbaijan Democratic Republic troops. Aftermath of the Shusha massacre of the city's Armenian population: Armenian half of Shusha destroyed by Azerbaijani armed forces in 1920, with the defiled Armenian Cathedral of the Holy Savior on the background. The largest Armenian-Azerbaijani ethnic clashes in Shusha took place from March–April 1920. From March 22–26 the Shusha massacre took place, which resulted in 30,000 Armenian deaths and the destruction of the Armenian quarter of the city. In early April 1920, Republic of Azerbaijan was in a very troubled condition. 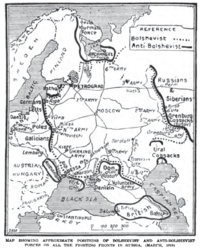 In the west the Armenians still controlled large parts of territory claimed by Azerbaijan; in the east, local Azerbaijani communists were rebelling against the government; and to the north the Russian Red Army was steadily moving southward, having defeated Denikin's White Russian forces. On April 27, 1920, the government of the Azerbaijan Democratic Republic received notice that the Soviet Army was about to cross the northern border and invade the Azerbaijan. Faced with such a difficult situation, the government officially surrendered to the Soviets, but many generals and local Azerbaijani militias kept resisting the advance of Soviet forces and it took a while for the Soviets to stabilize the newly proclaimed Azerbaijan Soviet Socialist Republic, headed by leading Azerbaijani Bolshevik Nariman Narimanov. While the Azerbaijani government and army were in chaos, the Armenian army and local Armenian militias used the opportunity to assert their control over parts of Azerbaijani territory, invading Shusha, Khankendi and other important cities. By the end of April, Armenian forces were controlling most of the western Azerbaijan, including all of Karabakh with the surrounding areas. Other occupied areas included all of Nakhchivan and much of Kazakh-Shamshadin district. In the meantime, Armenian communists attempted a coup in Armenia, but ultimately failed. In 1920–21, the only "solution" to this dispute could come either by military victory—as basically happened in Anatolia, Zangezur and Nakhchivan—or by the imposition from above of a new structure by an imperial power. After the British failed to impose a settlement, the imperial arbiters turned out to be the Bolsheviks, whose 11th Army conquered Karabakh in May 1920. On 5 July 1921, the Bolsheviks' Caucasian Committee, the Kavbiuro, under the chairmanship of Joseph Stalin decided that the mountainous part of Karabakh would remain under the jurisdiction and sovereignty of Azerbaijan. In July 1923, the Nagorny (or Mountainous) Karabakh Autonomous Region (NKAO) was established within Azerbaijan, with borders that gave it an overwhelming Armenian majority of 94% of the total inhabitants. In late November there was yet another Soviet-backed communist uprising in Armenia. On November 28, blaming Armenia for the invasions of Şərur on November 20, 1920 and Karabakh the following day, the 11th Red Army under the command of Gen. Anatoliy Gekker, crossed the demarcation line between First Republic of Armenia and Soviet Azerbaijan. The second Soviet-Armenian war lasted only a week. The Armenian national liberation movement was exhausted by the six years of permanent wars and conflicts; the Armenian army and population were incapable of any further active resistance. On December 4, 1920, when the Red Army entered Yerevan, the government of the First Republic of Armenia effectively surrendered. 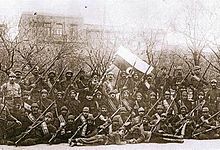 On December 5 the Armenian Revolutionary Committee (Revkom), made up of mostly Armenians from Azerbaijan, also entered the city. Finally, on the following day, December 6, Felix Dzerzhinsky's dreaded secret police, the Cheka, entered Yerevan, thus effectively ending all existence of the First Republic of Armenia. The Armenian Soviet Socialist Republic was then proclaimed, under the leadership of Gevork Atarbekyan. On February 18, 1921, a national revolt against Bolsheviks started. Gen. Garegin Nzhdeh, commander Garo Sasouni and the last Prime Minister of independent Armenia Simon Vratsyan took the lead of the anti-Bolshevik rebellion and forced out the Bolsheviks from Yerevan and other places. By April the Red Army reconquered most part of Armenia. However, Atarbekyan was dismissed and Aleksandr Miasnikyan, an Armenian high-ranking Red Army commander, replaced him. Garegin Nzhdeh left the Zangezur mountains after the Sovietization of Armenia was finalized in July 1921, leaving Azerbaijani-populated villages cleansed of their population. Persuaded by Soviet leadership, Zangezur had already been ceded by Azerbaijan to Armenia in November 1920 as a "symbol of friendship". The violence in Transcaucasia was finally settled in a friendship treaty between Turkey and the Soviet Union. The peace Treaty of Kars was signed in Kars by representatives of the Russian SFSR, Azerbaijan SSR, Armenian SSR, Georgian SSR and Turkey. Turkey had another agreement, the "Treaty on Friendship and Brotherhood", also called the Treaty of Moscow, signed on March 16, 1921 with Soviet Russia. By this treaty, Nakhchivan was granted the status of an autonomous region under Azerbaijan's protectorate, on the condition that the rights for protectorate would never be transferred to a third state. Turkey and Russia became guarantors of Nakhchivan's status. Turkey agreed to return Alexandropol to Armenia and Batumi to Georgia. ^ "New Republics in the Caucasus". The New York Times Current History. 11 (2): 492. March 1920. ^ Smith, Michael (2001). "Anatomy of Rumor: Murder Scandal, the Musavat Party and Narrative of the Russian Revolution in Baku, 1917–1920". Journal of Contemporary History. 36 (2): 211–240 [p. 228]. doi:10.1177/002200940103600202. ^ Homa Katouzian, State and Society in Iran: The Eclipse of the Qajars and the Emergence of the Pahlavis, (I.B. Tauris, 2006), 141. ^ Croissant, Michael P. (1998). Armenia-Azerbaijan Conflict: Causes and Implications. Westport, CT: Praeger. p. 15. ISBN 0-275-96241-5. ^ Malkasian, Mark (1996). Gha-ra-bagh! The Emergence of the National Democratic Movement in Armenia. Detroit: Wayne State University Press. p. 22. ISBN 0-8143-2604-8. ^ Walker, Christopher J. (1990). Armenia: The Survival of a Nation (revised second ed.). New York: St. Martin's Press. p. 270. ISBN 978-0-312-04230-1. ^ Hovannisian. Republic of Armenia, Vol. I, pp. 176–177, 181. ^ Hovannisian, Richard G. (1996) The Republic of Armenia: From London to Sevres, February – August 1920, Vol. 3. Berkeley: University of California Press, p. 132-133, 145–147. ISBN 0-520-08803-4. ^ a b Armenian-Azerbaijani Military Conflicts in 1919–20. ^ "Garegin Nzhdeh and the KGB: Report of Interrogation of Ohannes Hakopovich Devedjian" (in Russian). August 28, 1947. Archived from the original on 2007-10-30. Retrieved 2012-06-24. ^ Duncan, Walter Raymond; Holman (Jr.), G. Paul (1994). Ethnic nationalism and regional conflict: the former Soviet Union and Yugoslavia. Westview Press. p. 109. ISBN 0-8133-8813-9. Retrieved 2012-01-23. Wikimedia Commons has media related to Armenian-Azerbaijani War. This page was last edited on 10 February 2019, at 02:41 (UTC).